We attempted to watch the online "event" on Wed at noon on Old Spice's Youtube channel. There was nothing. We waited. Crickets. Still more nothing. Then, the comments started from other frustrated visitors. The funniest one being the one I saw yesterday morning. "Look at your comment. Back to mine. Back to yours NOW BACK TO MINE. Sadly, it isn't mind. But if you stopped trolling and started posting legitmiate crap it could LOOK like mine. Look down, back up, where are you? You're scrolling through comments, finding the ones that your comment could look like. Back at mine, what is it? It's a highly effective counter-troll. Look again, MY COMMENT NOW HAS MANY THUMBS UP. Anything is possible when you copy and paste." We were disappointed at the "lack of experience" for this Web Event. However, numbers are showing the hype has paid off and the videos are posting as a top viral for the week. Verdict? The prehype paid off. The real time event? A big disappointment. 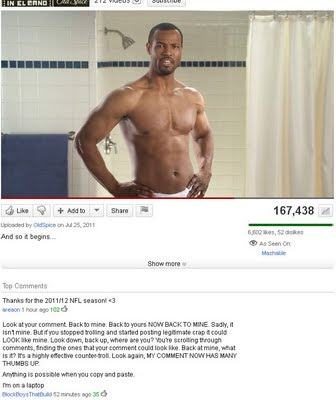 Will I buy Old Spice? This was the after shave I bought for my grandfather when i was 10. It will take more than Fabio to confuse me this is "Giorgio".